Nestled beneath the granite piles of Houndtor are the remains of a ‘Deserted Medieval Village’ or DMV. This medieval village is said to be one of three main examples of a Dartmoor deserted settlement, the other two being Hutholes and Dinah Clark’s. The Houndtor settlement lies on a gentle north-eastern facing slope at an altitude of 330m – see ill. 2 here. Today the post-excavation features are pretty much as the archaeologists of the 1960’s revealed with many of the walls, buildings, and ditches clearly visible. As with any landscape, what we see today is but a top layer of settlement and land use and the Houndtor area is a prime example. To let the land tell its story we have to strip the landscape down to the earliest layer of occupation – the Neolithic. In the early 1930’s a flint scatter (NMR no. SX77 NW85) was found near to Hound tor. In addition a low, stony bank was found stretching between the two granite outcrops on the eastern side of the tor. This is thought to possibly be what Newman et al, 1995, p.7, considers to be the remains of a Neolithic tor enclosure. English Heritage define these as being, “Large hilltop or hillslope enclosures in South West England, located close to rock outcrops, and surrounded by one or more circuits of stone built walls. All are prehistoric; some are definitely Neolithic”. On the northern side of Hound tor are the remains of an enclosure which contains a hut circle. To the north of Greator Rocks is a smaller enclosure which had no visible structure associated with it. On the western side of Houndtor lies a cairn which contains an marginally off-centre kist and a retaining kerb circle. On the open moorland to the south and east of the tor are remnants of several reave or boundary systems. These low banks average out at 1.5m wide and 0.6m high but much of the original stone has been robbed for later building. These later structures are supposed to date from the Late Neolithic to Early Bronze Age periods. 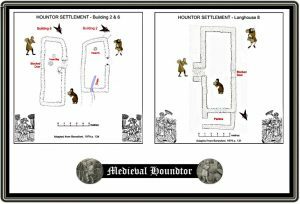 The next phase of occupation came in the medieval period the remains of which were first discovered in 1953 by Norman Quinnell who was working for the OS Archaeology Division. These were then excavated during the period from 1961 to 1975 under the supervision of Mrs E. Marie Minter. Sadly, she died before the report was fully written and Guy Beresford finally produced her findings in 1979. 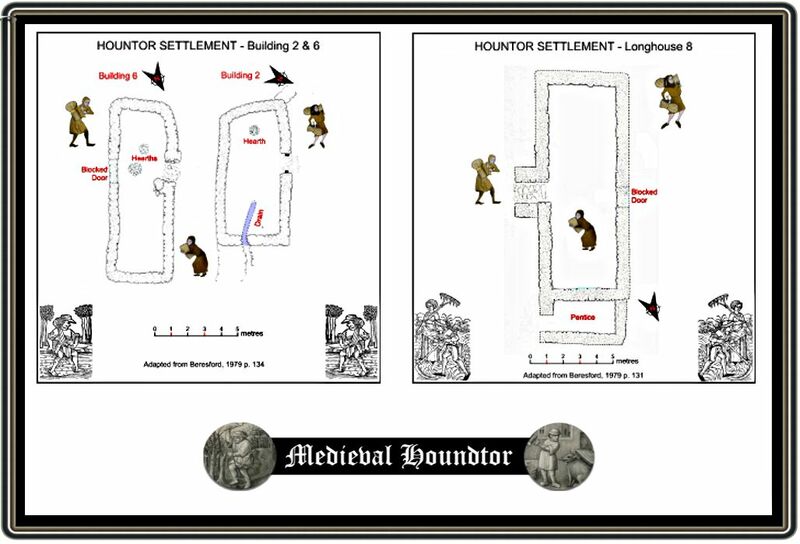 Her original thinking was that under Hut 1, see ill. 3 of settlement plan, were three earlier sunken huts or shielings. These would have indicated the next occupation phase but her findings had been ‘scoured’ by the construction of the medieval building. In her opinion these were early Saxon ‘grub huts’ or sunken floored dwellings. These, it was suggested were temporary dwellings used by herdsmen grazing their livestock during the summer months – Beresford, 1979, pp. 110-2. This theory was based on the evidence of stake holes found in the Minter excavations which pre-dated the stone structures and therefore indicated that they were turf houses. However, since then thinking has changed because a subsequent excavation at nearby Hutholes has cast doubt to the existence of these early features, Newman et al, p.3. The whole of the relict landscape and the medieval settlement sites were the subject of survey carried out in the spring of 1994 by the Royal Commission on the Historical Monuments of England. The survey was requested by the Dartmoor National Park Authority who, along with English Heritage, have entered into a management agreement for the main settlement site. So, the latest thinking now leaps the occupation forward from the relict prehistoric landscape to the medieval period. This settlement lies on a south eastern slope at an altitude of 330m and comprised of four longhouses, four other indeterminable buildings and three barns with grain driers, all orientated south west to north east. Each of the longhouses has an associated croft which comprised of a small plot of wall enclosed land. Luckily after her excavation the site was never backfilled which means many of the walls are still visible today. At the time access to the village would have been via a holloway leading up towards the north-west, as second track lead from the settlement in a south easterly direction to some springs. So, using the site plan, lets take a walk through the settlement starting at House number 1. This would have been a longhouse which internally measured 14.2m long and 4.3m wide. Although not visible today the excavations revealed paved thresholds and a drainage channel. Beresford, p.131, considers that this dwelling saw two phases of development, the second being the addition of porches to the doorways which were also paved and the construction of separating walls between the living area and the byre or shippen as it is known in Devon. At the same time the drain was extended and the fire place enlarged with the addition of an extra hearth. The actual longhouse was divide into two sections, the living area and the shippen where the livestock was kept. With phase 1 there would have been no dividing wall between the humans and the livestock which would have had its plus points and its negative ones. On the positive side the animals would have provided extra heat from their bodies in cold spells whilst the downside would have been the stench of dung and urine mixed with fire smoke, cooking smells etc. It also must have been pretty noisy with all the clamour of the livestock mixed with the general hustle and bustle of daily life. If we then turn right when leaving longhouse number one we would then be visiting the neighbours in the large longhouse number 7. The family that lived here were probably the modern equivalent of, “them at number 7”, possibly being of a superior status than their neighbours. This longhouse consisted of a living room measuring 15m long by 4.3m wide, two smaller inner rooms, a shippen, and a pentice or covered passageway which it’s assumed was a later addition. During the excavation a small cooking pit was found along with the remains of a fallen wattle and daub chimney hood. Beresford, p.133 considers that the first inner room would have been used to store the family’s more valuable items and a sleeping quarters. The second inner room is assumed to have been the medieval equivalent of a ‘granny flat’ and was used to accommodate a dependant relative. All in all I think this house might have been quite comfortable, especially with all the mod cons. Coming out of the ‘des. res.’ of number seven we then stroll down to two of the smallest buildings of the settlement. Building number 2 is built into and forms part of the southern boundary of the settlement. It measures 7.5m long and 3m wide. There is no associated toft or place where a house stood or had once stood with the structure. However, Beresford, p. 134 considers that it was a dwelling that simply comprised of a living area and a shippen. Newman et al, pp. 3 – 4, are not so sure and point out that no excavated evidence has been presented which would suggest a domestic setting. The other small building is number 6 and although a little larger, measuring 9.7m long by 2.6m wide, this too has no associated toft and seems to have been built into an earlier lynchet. Beresford, p.134 does bring our attention to the fact that the excavation revealed no traces of animals ever being housed at the lower end. From ‘down town’ Houndtor we now wander back up to another longhouse, this one, number 8 measures internally 12.3m long by 4m wide. There is an entrance on the eastern wall but Beresford, p.132 considers that another on the western side had been blocked up. This dwelling is typical of the random and unplanned development of the village as it appears to have been slapped down between existing dwellings. It also partially obscures the main thoroughfare of the village as well as blocking the shippen drain from longhouse number 7. All this could well indicate that it was a later construction post dating the other three main crofts, Newman et al, p.5. The design of the longhouse was a main living area and a shippen, it appears that it was later converted into a barn which coincided with the blocking up of the eastern doorway. The shippen floor was also lowered and a pentice added to the lower end of the building. The only evidence which is suggestive of the shippen was the central blocked drain. Right, better way mind your P’s and Q’s because now we are going to call on what has been described as the manor house of the village. This is where the Lord of the manor lived and as befitting his status this is the largest and grandest structure. Of the complex house number 3 is by the largest longhouse at Houndtor, measuring 17.3m long by 4m wide. The western entrance contains the remains of a substantial porch. The eastern doorway leads out into the fields via a wall flanked sunken passageway, this was thought to have facilitated the handling of cattle.. Associated with the longhouse are two gardens, a paddock, a cott, and barns. The inside of the house consisted of a living room, an inner room, and a shippen, both the inner room was built into the natural bank and resulted in the ground level being 0.5m higher than the living room, hence the provision of steps. The household cooking would have been done in the cooking pit hearth the central hearth. Houses 4 and 5 are contained within the manorial enclosure and are of a simpler and smaller design as that to the large ‘manor’ house. These, Beresford, p.133, considers were either dwellings for a dependant family member, Granny Flats again, or for use by servants. House 4 measures 7.5m by 4m and has an entrance in the south eastern wall. Beresford, pp. 133 – 4, notes that building was constructed in two phases. The first phase was that of a corn drying barn with a clearly marked kiln in the footings of the front retaining wall. The second phase entailed the removal of the kiln and the insertion of a small drain at the lower end. This suggests it was being used as a shippen and the hearth and cooking pit suggest a domestic use. House 5 measures 7m long and 2.5m wide and appears to have gone through three stages of development. The hearth once again is indicative of domestic occupation although there is no evidence of a shippen. During the second phase of construction a pentice was added and then the building ended up being converted to a barn in the third phase. Extraordinary when you think today we are converting barns into dwellings and back in the 13th century they were converting dwellings into barns – just shows the importance of food in medieval times. Next we come to the three buildings marked A, B, and C, these were built as barns and each contained a kiln, oven, grain drying platform, and in the case of A and B a hearth. The purpose of these structures was for drying corn and could well point to the reason for the final desertion of the site. 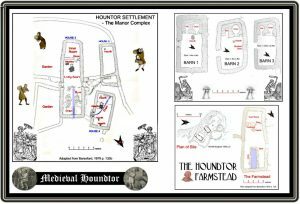 The final building at Houndtor is what was called the ‘farmstead’ and it is located 350m north of the main settlement. It was built over a small prehistoric settlement comprising of two hut circles and some vestigial enclosure walls. The farmstead comprised of three rectangular buildings and associated enclosures. The longhouse measures internally 11.2m long and 4m wide. There are adjacent entrances on the long walls, the south-eastern showing evidence of a possible porch. The building consisted of a living room, inner room, and a shippen. Excavations in the living room revealed the remains of another wattle and daub chimney hood and a small, ground level recess which Beresford, p.135, considers was a cupboard and is still visible today. The second house is quite a bit smaller and measures 8.3m long and 4.2m wide. This is built into one side of a prehistoric hut circle from which much of the stone had been robbed to build the house. The third building has today been lost under the turf but it is thought to measure about 4.2m long by 2.7m wide. This structure was never excavated but Beresford, p.104, suggests that it was a grain drying barn. It also appears that the second prehistoric hut circle was adapted for use as a pen of some kind, there is also evidence of a some small, walled garden plots. Having taken a stroll through the village and looked at what the building may have looked like and droned on endlessly about walls what about the more exciting aspects of day to day artefacts found in the excavation. Skeletons, coins, jewels, utensils etc. Well sadly there was virtually nothing found except some sherds of pottery. Chapman, 1996, p.25, notes that a coin was found which, “dates to the period 1253 – 60…”, but according to Beresford’s report, p.150, this was found during Minter’s excavation at Hutholes not Houndtor. From the pottery that was found most of it dates to the late 13th, early 14th centuries at Houndtor Village and the second half of the 14th century at the Farmstead. Much of the pottery was of the courseware or unglazed type, most of which was produced in the Totnes area. The usual assemblage of domestic stone artefact were found including pounders, pestles, rubbing stones and whetstones but strangely enough no mortars or querns. A 50mm hexagonal quartz crystal was found in the supposed manor house. The acidity of the peaty soils has meant that any metal objects had been completely rusted out. This apparent paucity of finds suggests that the desertion of the village was not a case of ’emergency evacuation’ as it appears that nearly all of the valuable domestic goods were taken away. This indicates a slow deliberate process of clearance and desertion without any immediate pressure. So what picture can we draw for life at Houndtor village during its occupation? We know from the presence of shippens that the villagers kept livestock this would have included cattle which would have provided milk and meat. The extensive field systems and corn drying barns indicate that cereals were being grown. This in turn would mean that along with meat and milk the cattle would also provide oxen for pulling ploughs and carts. As the manor was part of the Tavistock Abbey lands there is, as Robertson, 2002, p.14, suggests, a strong possibility that sheep were kept, although there is no conclusive archaeological evidence for this. If the manor of Houndtor was anything like the other Dartmoor manors then goats, pigs and a few ponies would also have been kept at the village. Archaeological evidence from excavation and pollen samples have revealed that oats and rye were grown in the fields. The various garden plots attached to the longhouses would have been used to grow herbs and vegetables and maybe to keep poultry in. It could be concluded that there were extended families living in the village from the existence of the so-called ‘granny flats’. Judging from the sizes of the houses there was a cross section of people ranging from the domestic servants and slaves to the higher status occupants of the ‘manor house’. Nobody exactly knows the day to day activities of the villagers but both documentary sources, paintings and illuminated manuscripts suggest the following farming year – see ill 11 here. “Reginald holds Great Houndtor from the abbot. Abbot Sigtrygg held it in Tre, and paid geld for half a hide. There is land for 4 ploughs. In demesne is 1 plough, and 2 slaves; and 2 villans and 4 bordars with 1 plough. There are 9 acres of meadow, and 2 acres of woodland and 1 league of pasture. It is worth 20s“. “Hugh de Houndtor, Kt. was in King Richards tyme seised of the whole tything of Houndtor, and had issue: Richard, Henry, Turgis and Osbert. Sir Richard de Houndtor Kt. had issue John and Andrew. Thomas sonne of Hugh Langdon bought Houndtor of John de Houndtor and had issue Walter Langdon wch had issue Thomas who granted unto Mabil his grandmother the manor of Hontor and she and the said Thomas sold the same and Little Manaton unto Thomas Gervais, a citizen of Exeter, and his sonne William sold the same unto Walter Dymock, a Lincolnshire man, employed in the Tynne works of Devon. From Dymock it descended unto Chichester and Britcheston. It is now also Thomas Southcots“, Linehan in Beresford, 1979, p.108. Confirmation of some of the above entries can be found in other documents, Richard de Hundetorra appears as signatory in a deed from Buckfast Abbey’s cartulary sometime between 1199 and 1216. He also appears in the Book of Fees for 1242 -3 and Testa de Nevill for the same year. In the Feudal Aids of 1284 it is noted that Benedictus le Bon and his wife Mabilla held Houndtor from Robert le Dennys who held it from Tavistock Abbey. They also show that in 1303 Mabilla de Langdon held the fee. This being the same woman indicates she married twice. This must have been about the last record pertaining to the settlement of Houndtor before it was deserted. 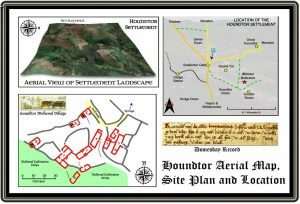 There is no direct evidence to link the possible ‘manor’ house at Houndtor Village as being the actual residence of the Lord of the manor of Houndtor. The dating evidence from the excavated pottery sherds suggests that the occupation of the village did not commence until the late 1200’s at the earliest which would be when the ‘le Deneys’ held the manor. The big question is, “what happened that made all the inhabitants of Houndtor Village simply pack up and leave”? 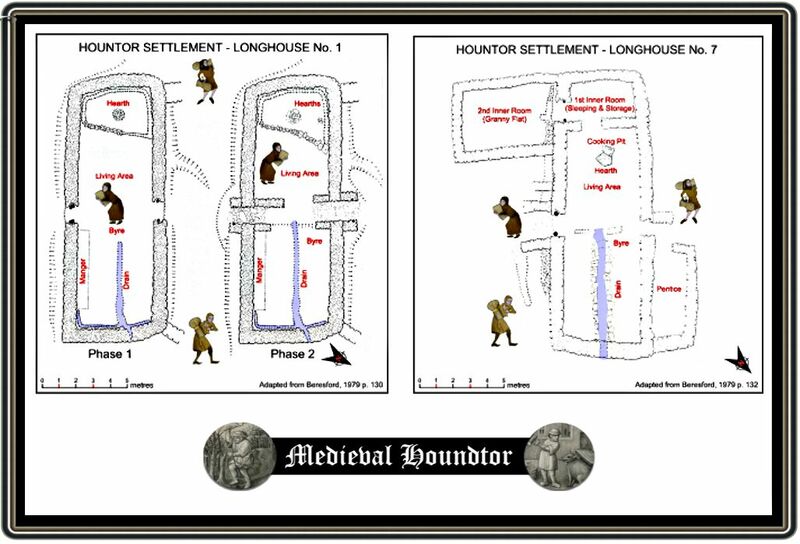 There are many factors that lead to the desertion of medieval settlements but the two most common were deteriorating climate conditions and the bubonic plague or ‘Black Death’ both which coincided within a few decades of each other. The principle of grain harvest have for centuries remained virtually the same, the whole idea is to cut the corn when it is as dry as possible, usually when the grain has a moisture content of 30%. In medieval times the sheaves would be left in the field for between 10 – 14 days to further ripen and dry. As a crop, oats have a tendency to ferment if not completely dried so it was imperative to ensure the grain was dry before bringing it into the barn. If the climatic conditions were wet this meant the only way of drying the grain was by artificial means, namely corn drying kilns. The very fact that at Houndtor village three grain drying barns were built would suggest the need to dry the cereals which in turn would imply a trend towards a much wetter climate. 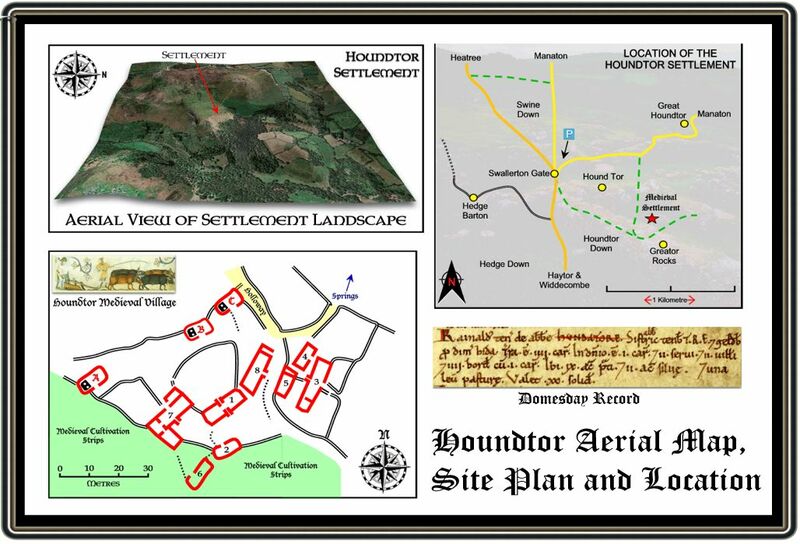 It is a well know fact that this was indeed the case and between the 13th and 14th centuries there was a gradual deterioration in the British climate, especially on land over the 308m contour which would include Houndtor. This meant that if the weather was wetter and colder life became a lot harder and the villagers were faced with the extra drudgery of trying of trying to produce enough food to live. In addition it was quite possible that the wet conditions brought with them the increase of disease in the livestock which again would effect the food supply. In 1984 Austin, pp. 147 – 151 published the findings of some pollen analysis which he undertook at Houndtor. The samples were taken from the peat soils around the sources of the springs on th eastern side of Houndtor Down. 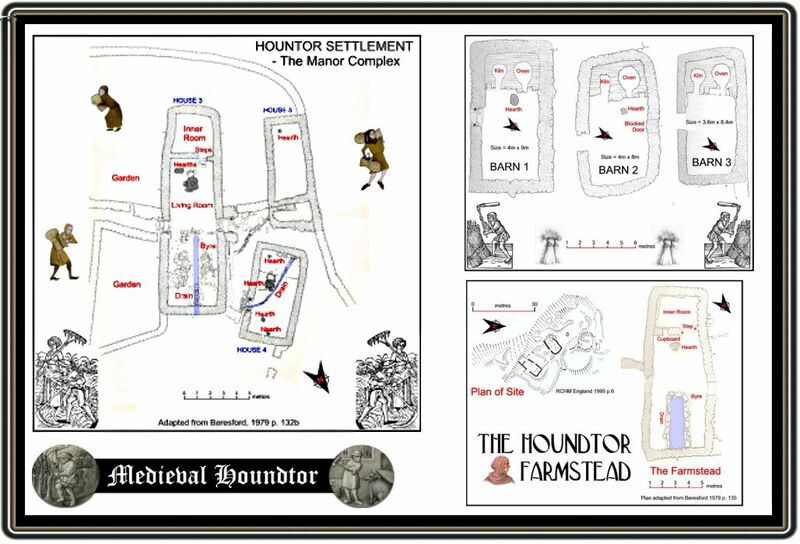 Whilst the whole idea of this work was to challenge some of Beresford’s conclusions on Houndtor, and which I have not included, they did confirm several points regarding the cereal production around the settlement. which ties in nicely with the archaeological evidence which suggests the settlement had been abandoned by the mid 14th century. But would this climate change be enough to force people from their homes? As mentioned above, the ‘Black Death’ struck Britain in the period between 1348 and 1350 which ties in with the environmental archaeological and the excavated archaeological evidence which suggests Houndtor was abandoned in the mid 1300’s. Whilst there is no direct evidence that the plague ever struck the inhabitants of Houndtor it certainly hit Devon where about a third of the population died. So imagine if you were living in the village at this time, you are on high moorland that is experiencing an ever increasing wetter climate. Your crops are failing, the animals are succumbing to disease and all of a sudden there are numerous, more productive farms left vacant by the plague on the lower lands of Devon. Would you stay or would you go? 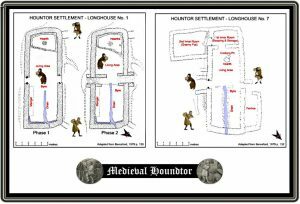 And that is possibly why the settlement at Houndtor became to be abandoned, as previously stated, it was not an immediate occurrence but one which happened gradually over several years. Once the people had gone the building began to crumble and although the land was still farmed it gradually reverted to pasture and to virtually what we see today. If this has inspired you to visit the old deserted village of Houndtor, which I hope it has, then pick a crisp Autumn day when the late shadows highlight the remains of the villagers efforts to wrest a living from the Dartmoor soils. You will see some of the field boundaries picked out in the shadows and possibly some of the lynchets. As you walk down to the village you may even hear the sounds of the cattle lowing in the shippens and children playing in the sunken holloway. Look around the low crumbling walls which at one time made the longhouses, smell the oats drying in the barns and if you are really lucky you will look through the window of the ‘manor’ house and see the lord admiring a crystal that his son found up by the tor – who says this is a Deserted Medieval Settlement? Austin, D. 1985 A New Landscape Context for Houndtor, Medieval Archaeology, No. 29. 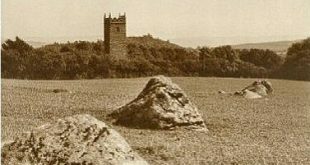 Beresford, G. 1979 Three Deserted Medieval Settlements on Dartmoor, Medieval Archaeology, No. 23. Chapman, L. 1996 Grimspound & Houndtor, Orchard Pub. Newton Abbot. Newman, P., Probert, S. & Riley, H. 1995 Houndtor Down – a Survey by the RCHME, RCHME, Exeter. very interesting and informative. Thanks very much. I first went to the village 50 years ago and heard various stories. It’s great to have them confirmed and expanded on. I go there quite a lot and wander around the remains of the village. This informative article provides a fresh and detailed insight with which to imagine the village and inhabitants the next time I go. Thank you.